Check out the Pups for Sale Page!! New Tiny Teacups... Check out the Pups for Sale Page! We want to Thank you for giving us this time to show you our beautiful Teacup Yorkie and Tiny Teacup Yorkie puppies. We specialize in raising Healthy and Happy Teacup Yorkie and Tiny Teacup Yorkie Puppies. We believe that we have the highest quality Teacup Yorkies and TIny Teacup Yorkies around! If you love the shiny, beautiful coats, babydoll faces & compact bodies, then you are at the right place. We have been breeding Teacup size Yorkshire Terriers for over 26 years. If you are interested in one of our Yorkie puppies, then please call 318-386-6276 and speak with Goldie live. Due to all the scams out there, we prefer to speak with all of our potential Yorkie puppy owners. Remember: If you haven't actually talked to Goldie, then you are not dealing with Goldies Yorkies!! Our Teacup and Tiny Teacup Yorkie puppies are all accustomed to lots of human interaction and love, they are a commitment and purchasing one, should not be taken lightly. Yorkies are famously inquizative and can be stubborn, so don't let them get the uppper hand! Our commitment to you does not end when you purchase one of our Teacup or Tiny Teacup yorkie puppies. We are available to speak with you if any problem arrises or if you just want to talk about Yorkies! 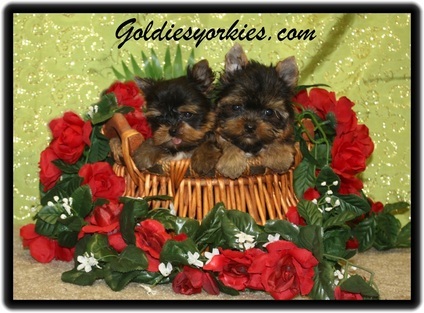 Thanks for stopping by and please check out the Yorkie puppies we have available on our Pups for Sale page. and can be punished by fines up to $ 10,000 and jail up to one year.